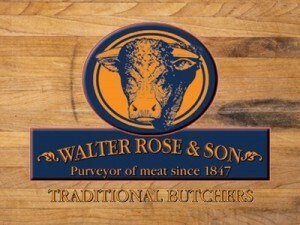 Walter Rose & Son is a multiple award-winning retail and catering butcher. Whilst they are a dynamic and thoroughly modern butcher, they never forget the cornerstones that the business was founded on – master butchery skills, authenticity, hand-made products, great personal service and attention to detail. The two family-run butcher’s shops are located in Wiltshire market towns. Walter Rose & Son also has a thriving catering business supplying some of the country’s top chefs and restaurants, which include Michelin Star restaurants. Quality links everything that they do, they have built longstanding relationships with like-minded Wiltshire and Somerset-based farmers who practice excellent animal farming and welfare, using natural feed and not rushing animal growth. The business is run by Steve Cook and his sons Jack and Charlie. Steve has numerous electric contracts but the one which concerned him the most was the butchery, using 350,000kwh per year. They had a single rate meter on this site. What was apparent from the start of understanding the business was the refrigeration runs 24/7 however they were paying a single rate, resulting in paying over the odds during night hours. We proposed arrangement for another supplier to change the meter clock, this was done without changing his meter, a simple procedure but over looked by previous suppliers. The end result was a saving of 10% on just one bill, which would be on going, every year. Walter Rose & Son use Energy Procurement for all their meters, a service they have required for several years. Pricing and service is very important to Steve but above all getting the correct advice is paramount. Steve has always checked our advice against other suppliers and has remained with Energy Procurement due to the service they receive. Energy-Procurement is also proud to say that we look after some of the farms that supply Walter Rose & Son. Energy Procurement’s Liz Jenkins will continue to work closely with Walter Rose & Son to ensure they continue to receive the best rates and service they possibly can. Liz is also currently working on renewable projects for the butchers to help further reduce their costs in the future.